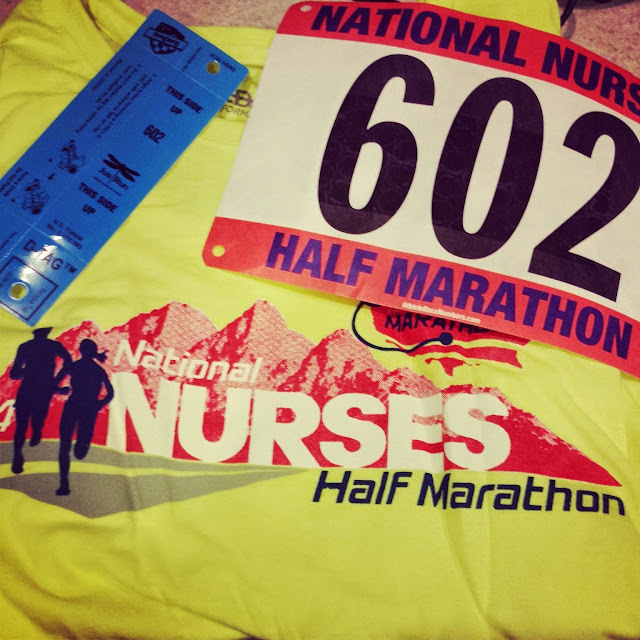 This past Saturday, I participated in my very first small, local race: The National Nurse's Half Marathon (btw, no, it's not just for nurses and no, I'm not a nurse). 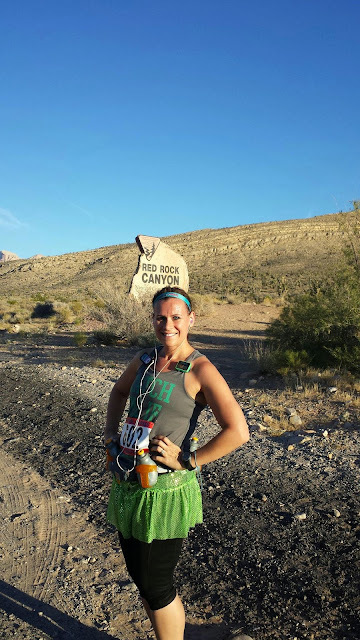 This race is a point to point road race along the rolling hills of the Red Rock canyon area in Las Vegas. I attended the expo Friday night. Some of my Zumba instructor friends were exhibitors, so it was nice to see familiar faces. Also, I finally got to get some Shoe Frosting! If you ever see these girls at an expo, go say hello! They are super sweet and so much fun :) I think I showed a ton of restraint by only buying 6 "frostings"! The expo was really small, but efficient and well-organized. They had amazing speakers--I wish I wasn't at work all day so I could have listened to more. 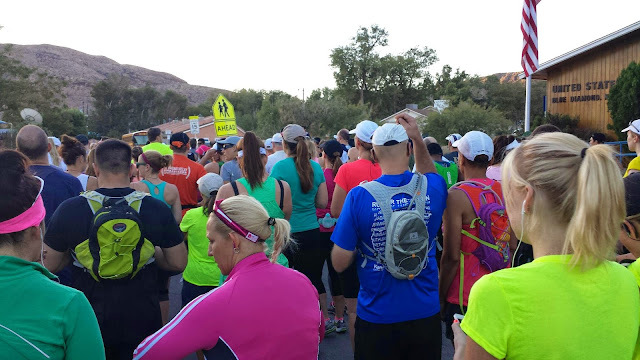 I was pretty nervous for this race--I would be going alone, driving myself to the start, and running on my still healing knee (12 weeks post-surgery and counting!). I already had the Disneyland Half under my belt, but the 3 hour finish was far from what I wanted to run today. My goal was to shave off 15 minutes and come in around 2:45. We were off pretty much on time. A quick stroll through Blue Diamond and we were well on our way on the streets in the canyon. It was so nice to be on an open course where you didn't have to weave around tons of people. 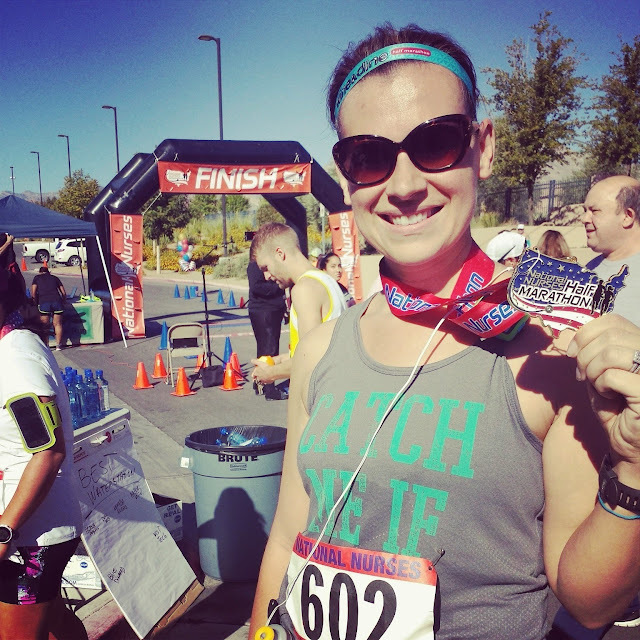 I was able to set my own pace, stop when I wanted, and really "run my race". The first 4 miles were hilly for me. My legs (especially my right leg) were cramping early and feeling unprepared. Also, without the typical huge start and long walk to corrals, I didn't do a good job of warming up. I was texting my hubby at mile 4 to bring ibuprofen! The up-hill/down-hill is really hard on my knee. I also made the mistake of not taking enough walk breaks early. I was so in the zone and felt so good I didn't want to stop running!!! It was one of those mornings where I really need to talk myself off a ledge--I'm running injured--I just can't do what I used to do! 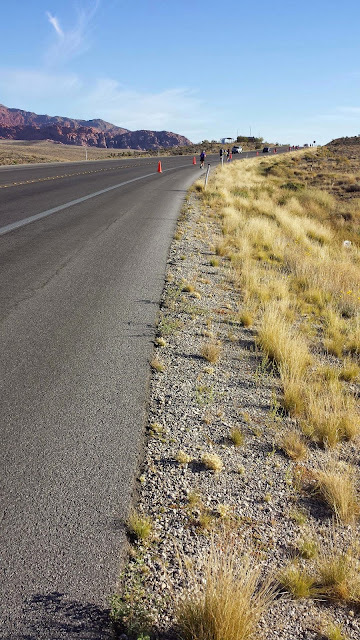 Once we were past mile 4, the course got much flatter and easier. My knee quickly recovered and my legs started feeling better. At mile 6, I smartened up and went to my intervals: 1:30 run/1:00 walk. This is how I've been training, so it just made sense. As soon as I switched to these intervals, my run speed increased and I was hitting a comfortable stride. Before we close out, I have to tell you about the course--it was seriously B-E-A-U-T-I-F-U-L!!!!! It is not what you think of when you hear Vegas for sure! The mountains, rocks, scenery--just amazing! 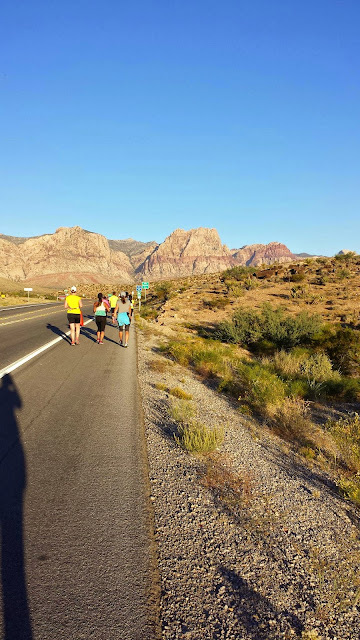 This stretch of road is full of runners, bikers, and other athletes on any given weekend morning, so I plan to add this "course" to my regular running schedule. One more half in the books!